From the Publisher: This lively poem by the author of Goodnight Moon tells the tale of one little boy’s letter. What happens after the boy drops it into the mailbox? How does it get to his grandma’s house? Children will enjoy this rollicking tale of the seven little postmen who got the mail through. Mike Mulligan and His Steam Shovel by Virginia Lee Burton tells the story of Mike and his steam shovel, Mary Anne. Mike and Mary Anne dig all kinds of things from canals and roads, to basements for skyscrapers. When gasoline, electric, and Diesel steam shovels come along, no one wants to use a steam shovel anymore. Mike and Mary Anne find themselves out of work. When Mike learns that the small town of Popperville needs a new town hall, Mike decides to take Mary Anne and go dig the cellar of the new building for the town. When they get to Popperville, Mike and Mary Anne are in for the biggest challenge of their lives! In the end, friendship and hard work prevail in this heart-warming picture book. Stellaluna by Janell Cannon tells the story of a little fruit bat who is knocked away from her mother when an owl attacks them. After a long night of clinging weakly to a twig, Stellaluna drops down into a bird’s nest full of baby birds. The little fruit bat is adopted by the bird family and learns their bird-like ways even though they are unnatural to her. Eventually, Stellaluna is reunited with her bat family and learns all about how bats live. This book includes two pages of fun and informative notes about bats. From the publisher: Bats fly into the spotlight in this exploration of such basics as where the live, how mothers raise their pups, and how they hunt for food. Included as well is a simple plan for a building a backyard bat house. From the publisher: People have taken dangerous risks trying to fly. Some inventors built wings for their arms and flapped them like birds. Others tried to fly with balloons or tried to glide with the wind. This book describes the creative, fascinating, and wacky experiments that people tried before the airplane was invented. The Little Island by Margaret Wise Brown tells the story of the little Island in the ocean. So much happens on and around the island! Fish swim around it, flowers bloom, fog rolls up, and boats sail to it. One day a kitten comes to the island and discovers by talking to a fish that all the land is really one land, even under the water. The spectacular illustrations of Leonard Weisgard perfectly capture the beauty and isolation of the little Island in the ocean. From the publisher: "Why is there winter in the Southern Hemisphere at the same time there is summer in the Northern Hemisphere. Here is an explanation of how the position of Earth in relation to the sun causes seasons, and the wonders that come with each one of them. Summer. Autumn. Winter. Spring comes again. Year after year the seasons repeat themselves." From the publisher: This updated [3rd] edition includes some of the latest discoveries in space exploration and the classification of Pluto as a dwarf planet. A Time to Keep by Tasha Tudor goes month by month through the year describing all the holidays as they were celebrated when a little girl's mother was young. The delicate illustrations by Tudor give life and warmth to the many family gatherings and celebrations recounted in this book. 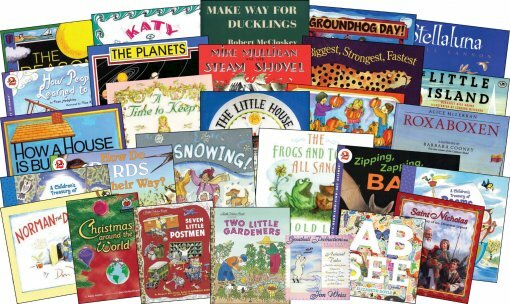 From the Publisher: What child’s bookshelf is complete without a superbly illustrated collection of classic poems? This exquisitely produced anthology, which features embossed pages and flocking on the spine, will become a beloved family favorite. Featuring the most renowned creators of children’s verse, it makes the perfect read-aloud and an ideal introduction to poetry’s rhyme and rhythm. Kids will love listening to the imaginative words of Lewis Carroll (“How Doth the Little Crocodile?”); Kate Greenaway (“The Cats Have Come to Tea”); Edward Lear (“The Owl and the Pussycat”); Vachel Lindsay (“The Little Turtle”); and many others. From the publisher: Big, small, round tall—pumpkins come in all shapes and sizes. Here one learns the marvels of the growth cycle of these incredible plants—from flat seeds, to thick vines covered in golden flowers, to brilliant orange pumpkins! Gail Gibbons also relates the special role pumpkins played in the first Thanksgiving. Simple and clear directions for drying seeds, planting and tending pumpkin patches, and carving funny or scary faces are included in the book along with a fascinating section—her signature page 32—on pumpkin facts and lore. From the Publisher: The biggest snake, the anaconda, can swallow a deer or goat whole. The smallest mammal, the Etruscan shrew, could easily sleep in a teaspoon. In a striking full-color collage, each spread of Biggest, Strongest, Fastest portrays an animal that stands out in the animal world as the largest, slowest, longest lived. Readers can see the animal's size in relation to something familiar, and a chart on the last page indicates the size, weight, and diet of each animal, as well as where it can be found in the wild. Biggest, Strongest, Fastest is an entertaining, informative introduction to the "world records" held by fourteen members of the animal kingdom. From the Publisher: In Mexico at Christmas time, children carry candles in nine nights of parades. German children listen for Kris Kringle to bring presents on Christmas Eve. Families in Australia like a picnic on the beach. And in Ethiopia, Christmas is the time to play a hockey-like game called genna. Come take a trip around the world to see how this special time of year is celebrated in eight countries. Your child may think they know all about Santa Claus, but introduce them to the real Saint Nicholas! By reading Saint Nicholas: The Real Story of the Christmas Legend they'll also learn that God is even more generous and gave the greatest gift of all---Jesus. From the publisher: "Small, soft flakes fall quietly from above. It's snowing! People like to sled and ski in it, but what exactly is snow? How does it form? While it is believed that no two snowflakes look exactly alike, most have either six sides or six points. Included in this crystal clear introduction to one of winter's wonders is information about different types of snowstorms, regions where snow falls, and how to prepare when a snowstorm approaches." In Katy and the Big Snow by Virginia Lee Burton, the town of Geoppolis gets buried under feet and feet of snow after a huge storm. Thankfully Katy the red crawler tractor has her snow plow and can dig the city out! Follow Katy as she tunnels through snow to the police station, post office, railway station, telephone company, water department and more. Katy chug chug chugs along, clears the roads, and saves the day with her snowplow. From the publisher: Every February 2, people all across the country wonder about the groundhog, Punxsutawney Phil. Will he see his shadow on that day or won't he? Will spring come early or late? Here is information about Groundhog Day, its origins, and the animal at the center of this delightful annual event. From the Publisher: A beautifully illustrated, graphic alphabet book with a fun search-and-find twist. Hidden in each graphic letter are tiny troves of ABC treasures waiting to be found by sharp-eyed readers. Can you find the apple, arrow, and armor in the letter A? Or the bear, banjo, and bike buried in the letter B? Read along in this unique alphabet board book that asks audiences to A B See beyond the ABCs. The Frogs and Toads All Sang is a new collection of short poems about frogs and toads by Caldecott Medalist Arnold Lobel. This collection is illustrated by Adrianne Lobel, daughter of the author, and is full of the warmth and humor for which Lobel was so well-known. Young readers will enjoy the clever illustrations and the joyful rhyming stories found in this handsome edition of The Frogs and Toads All Sang. From the publisher: Describes how the surveyor, heavy machinery operators, carpenter crew, plumbers, and other workers build a house. From the publisher: Birds don't need maps! Make Way for Ducklings by Robert McCloskey won the Caldecott Medal for the most distinguished American picture book for children in 1941 and has been beloved my millions of readers. In this timeless classic, a mother duck, Mrs. Mallard, is sure that the pond in the Boston Public Gardens is the very best place to live with her eight little ducklings while she waits for Mr. Mallard to return from an exploring trip. She just isn't sure how to get there through the crowded and dangerous streets of Boston. Thanks to some help from several faithful Boston police officers, Mrs. Mallard and her little ducklings Jack, Kack, Lack, Mack, Nack, Ouack, Pack, and Quack arrive safely at the pond in the Gardens where Mr. Mallard is waiting for them. Sing or read the sweet songs with your child in A Children's Treasury of Lullabies. With the bright colorful illustrations and fun songs, your child will enjoy the lullabies of this timeless book. Norman the Doorman by beloved children's author Don Freeman tells the story of Norman the mouse who works as a doorman at an art museum. Norman gives tours to all his friends of the lovely things stored in the museum's basement, but he is always careful not to get caught by the upstairs guard. Norman loves creating art as well, and one day he makes a wire sculpture from the leftover parts of a mousetrap. When Norman sees a sign for a sculpture contest being hosted by the museum he eagerly enters his artistic mousetrap creation. Freeman's warm and witty colored pencil illustrations perfectly depict the story of Norman the artistic mouse and the surprising way he wins a contest and befriends a museum guard. Roxaboxen by Alice McLerran describes a scraggly hill across the street that the children called Roxaboxen. The sandy hill was littered with wooden boxes, ocotillo plants, and cactus, but in the minds of the children who played there it was a magical place. For the children, Roxaboxen was a town with white stone-lined streets, a town hall, and ice cream shops. There were cars, and a jail, fierce wars between boys and girls, and plenty of stick horses. Roxaboxen was a hill in the desert, but it was also a place that lived on for a lifetime in the memories of the children who played there. In hues that evoke the desert landscape, artist Barbara Cooney captures the power of imagination and the magic of Alice McLerran's story of Roxaboxen — a place that was real and always will be. 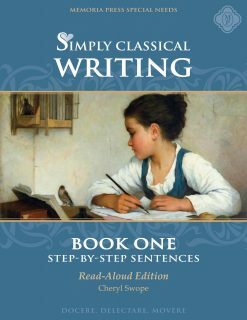 A companion set of read-aloud books to be used with Simply Classical Writing: Step-by-Step Sentences, Book One (Read-Aloud Edition). These books are included with the purchase of Simply Classical Curriculum: Level 2 Literature, Science, History, & Geography Read-Aloud Set.